How do I use the icons and colors in the New Gradebook? The Gradebook includes several icons and colors that may display in the assignment columns, assignment groups, and Total column. 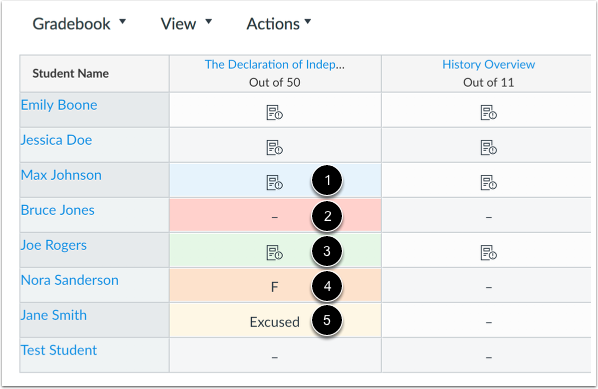 Icons and colors are simply gradebook indicators to assist you with course grading. All published assignments count toward a student's total grade unless they are excused assignments. When weighted assignment groups are not enabled, the total column also includes a warning icon notifying you that the grade you see differs from the grade the students see because one or more graded assignments are muted. If an assignment column displays a muted icon and all cells are grayed out, the assignment is moderated. The Black Warning Icon  notifies you that the final score does not include one of the assignment groups because the group has zero points possible (the warning will tell you which assignment group is affected). This icon only displays in the total column related to assignment group errors. You can correct the assignment group warnings by making sure a weighted assignment group has an assignment worth more than zero points, or, if an assignment is supposed to have zero points, adding another assignment with more than zero points to the assignment group. The Red Warning Icon  notifies you that the entered grade is not supported in the grading scheme. Canvas will also display an invalid grade warning message when an invalid grade is entered. 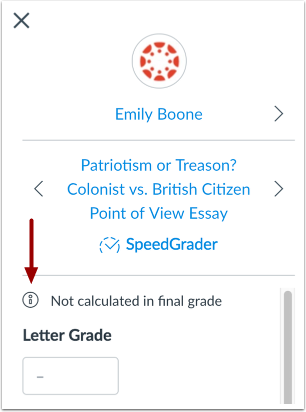 The Grade Detail Tray Warning Icon displays a warning icon for assignments that are not calculated as part of the final grade. This icon displays if the Do not count this assignment towards the final grade option is selected, or if the assignment is in a weighted assignment group with no weighted percentage. The Grade Detail Tray also reflects if an assignment is muted. Status colors in your Gradebook may vary, as you can change the status colors for each status in the Gradebook. However, you cannot change the status names. Gradebook rows alternate white and gray shading, so some colors may seem darker if they display in a row with gray shading. 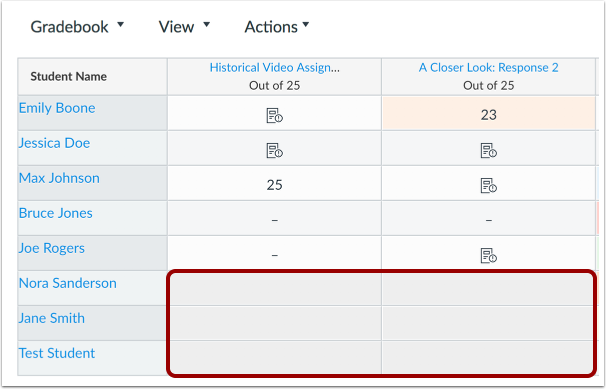 When using differentiated assignments, the assignment appears as a column for all students, but grade cells are grayed out for students who are not part of the assignment and do not include a dash. Grades cannot be assigned to students who are not part of the assignment; those assignments are not factored into overall grades. In the student grades page, students can only view assignments that have been assigned to them. Differentiated assignments are also used in MasteryPaths. If your course uses multiple grading periods, submission cells for an entire assignment in a closed grading period are grayed out in the Gradebook. Assignments in a closed grading period cannot be edited. Some columns are completely disabled until the status of the assignment is changed. Disabled columns do not include dashes in the Gradebook cells, which indicates that grades cannot be entered, and display a gray background. Disabled columns are labeled for unpublished assignments  and anonymous assignments . Grades cannot be entered for unpublished assignments until the assignment is published. 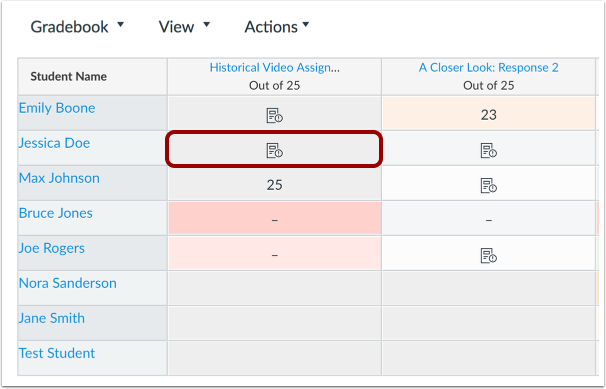 For anonymous assignments, grade cells do not display any content, including the Needs Grading icons, until the assignment is unmuted. Note: The Anonymous label supersedes the Muted label. Assignments that are both anonymous and moderated display as anonymous, though the Grade Detail Tray displays the assignments as being muted. Moderated muted assignments can be updated in the Gradebook, but any entered grades will be overwritten once final grades are posted. Previous Topic:How do I create assignment columns for non-submission assignments in the New Gradebook? Next Topic:How do I sort an individual assignment column in the New Gradebook? Table of Contents > New Gradebook > How do I use the icons and colors in the New Gradebook? How do I sort an individual assignment column in the New Gradebook?